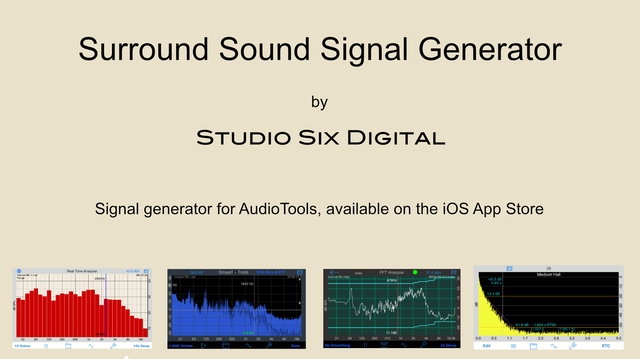 Studio Six Digital has released a Surround Sound Signal Generator for Apple TV. This app is available from the Apple TV App Store. Just navigate the the App Store on your Apple TV, and search for “Surround Generator”. When you have installed this app, you will get a variety of test signals that can be used with our AudioTools app. These can help you check speaker polarity, delay and EQ to optimize your surround audio experience. Signals are currently available in 5.1 and 7.1 format. We expect to be including more test signals over time, to support Dolby Atmos in various configurations. Test signals available now include Pink Noise Full Band, Pink Noise Midband, Impulse Response sweeps, Polarity, and Impulse (for ETC). Select one single loudspeaker channel, or route the signal to all channels, or activate a cycle to move the signal around the room. This is a must-have app if you do any surround audio work.